Birch Trees on the Bruce, at Nottawasaga Bluffs, originally uploaded by Gregory Pleau. This is a photo taken at Nottawasaga Bluffs Conservation Area in Grey County. It is (very) early spring, so the foliage is not quite out yet. I was here with a group of geocachers for a 36km hike from Lavender Village to Clearwater Twp Road 91, along the Bruce Trail. This is very close to one of my favourite geocaches that I’ve visited – it’s called Ragnarok. This is heading away from that geocache on the Bruce Trail, heading east. One of my favourite photographs of all time is one I have framed in my living room here, by Ansel Adams. It features tall birch trees lit from the side in an otherwise dark forest. 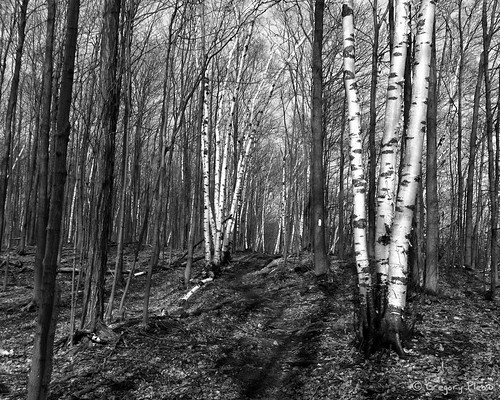 I am always keeping my eye out for birch stands thanks to that photograph, and one thing I learned on this hike is that Grey County is blessed with many birch trees along the escarpment here. I will likely be back with my Nikon on a day where the lighting is favourable. This photo was taken with my iPhone 4, and converted to Black and White in Photoshop with a (simulated) Red filter. I cropped it to 8×10 as well in Lightroom before uploading it to Flickr. Previous PostBFL Crew Borrows a T.A.R.D.I.S.